Statement Rolf Ekéus – Détente now! As an admirer and supporter of Egon Bahr I am eager to join this excellent initiative. As you probably know I was, with former prime minister Ingvar Carlsson, former foreign ministers Karin Söder and Hans Blix, a member of the Swedish quartet in support of a world free from nuclear weapons. I am actively engaged in a number of initiatives lead by US senator Sam Nunn, former British minister of defence Des Browne and former Russian foreign minister Igor Ivanov aiming at developing a functioning dialogue about Euro Atlantic security in the spirit of Willy Brandt and Egon Bahr. 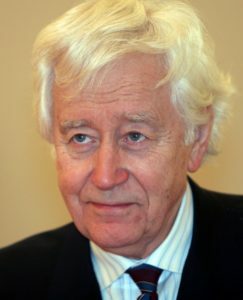 Rolf Ekéus, (Swedish diplomat, Disarmament ambassador 1983-91, Executive Chairman disarming Iraq 1991-97, Ambassador to the USA 1997-2000, OSCE High Commissioner National Minorities, 2001-2007, Chairman SIPRI 2001-2010).